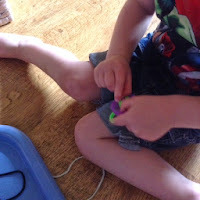 For quite a while I've wanted to get T some big threading buttons from ELC but I never got round to it and now I'm thinking it's just not worth it, I can't see him playing with them for long. 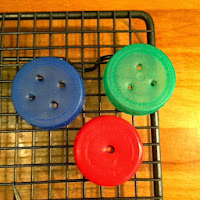 Since he was very young, T has played with my button box and threaded them onto shoe laces or his favourite, pipe cleaners, this worked fine for us both, although the larger buttons I have are a bit dull! 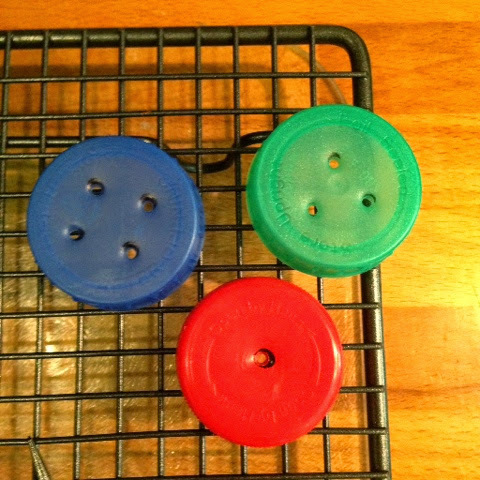 A while back I started to collect milk bottle tops, we've used them for colour sorting and matching and I had the idea to drill holes into them to make our own buttons. 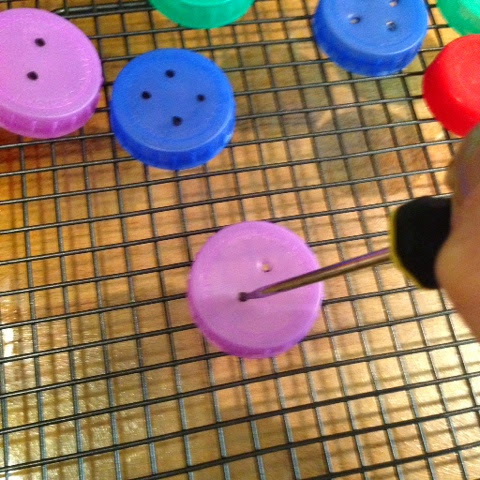 In fact, we didn't need to drill them, I just used a bradawl. 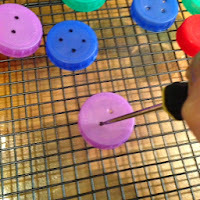 I placed a chopping board onto our work top and placed a cake rack on top, after marking up where I wanted the holes, I laid out the bottle tops onto the cake rack and used the bradawl to make the holes, this was really quick and easy - much easier than I expected. Within minutes, I had a supply of buttons! A rub with some anti-bac hand sanitiser removed the pen marks. 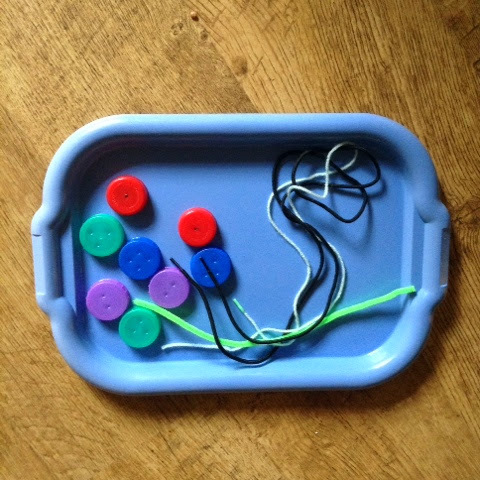 Like all Mum's there are times when I need to get on, generally in the kitchen, when I introduced these 'buttons' to T, I set up a simple invitation to play for him whilst I was cooking dinner. He spent quite some time playing and counting the holes in the buttons, saying the colours and generally making up his own entertainment for a while! T's returned to this invitation a few times but for now it's been bagged and put in his changing bag as a surprise for when we are out and need a distraction. This would be a great activity for a rainy afternoon and it's nice an portable so would be good for camping or even out in the sunshine. To extend this play, I'm going to get T to match up the buttons with the right number flash card or in a counting book, he's really loving counting and has just started to distinguish numbers so I think he'll like that. How do you use your threading buttons? I'd love some more suggestions, leave me a comment with what you do and I'll pop by to check it out. This post is linked to Link & Learn at no time for flash cards & mummy bloggers weekly Wednesdays. What a great idea! Saving bottle tops now!